Last Thursday, September 27, we carried out the fire resistance test of our panels BSF 200, in the Test Center (LICOF) of the Association for the Promotion of Research and Technology of Fire Safety (AFITI) located in Toledo, Spain. 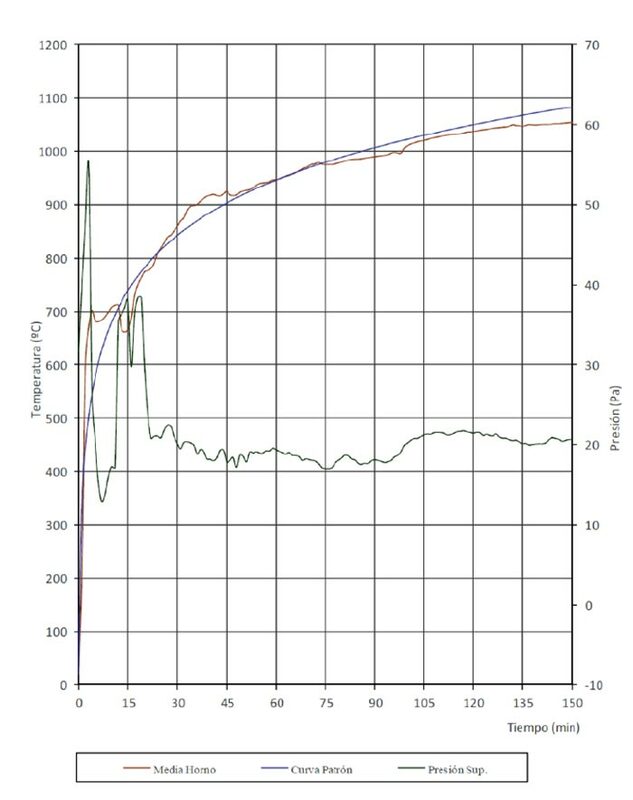 The test consisted of exposing the underside of our floor to the interior of a furnace where temperatures follow a standard curve as a function of the duration of the test. Figure 1. Evolution of the average oven temperature, pressure and heating curve. As can be seen in Figure 1, the temperature increases very rapidly; in 5 minutes it reaches 576.4ºC. 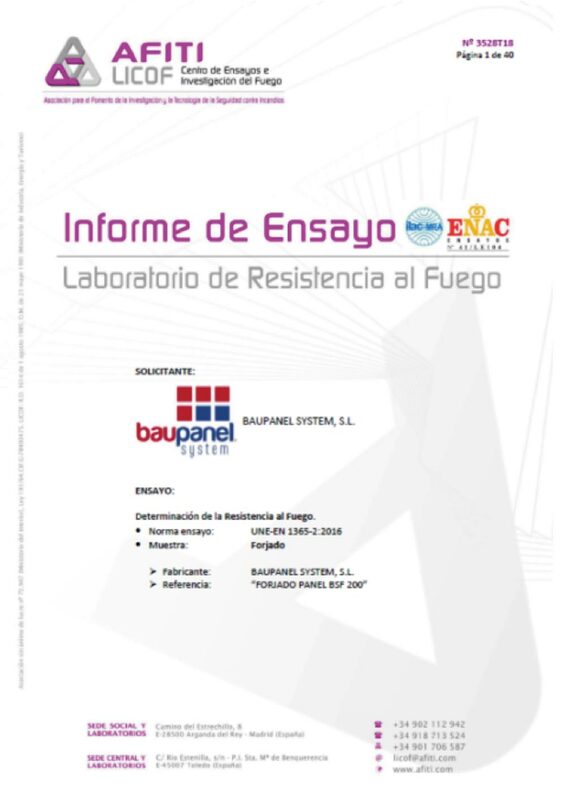 The slab had a free light open to the fire of 4.00 m x 4.00 m. The tests have been carried out according to the UNE-EN 1363-1: 2015 standard “Fire Resistance Tests – Part 1: General Requirements” and UNE-EN 1365-2: 2016 “Fire resistance tests for load-bearing elements – Part 2: slabs and cover “. Figura 2. Section of Baupanel panel type BSF 200. The panel’s own weight is 234 Kg / m2 plus the weight of the screed and gypsum plaster. In this way a total dead weight of 341 Kg / m2 is achieved. The total applied overload was 8,000 Kg (500 Kg / m2). Therefore, the slab panel had to withstand a total load of 841 Kg / m2 during the entire test period. Figure 3. View of the upper face of the slab with the loads placed. 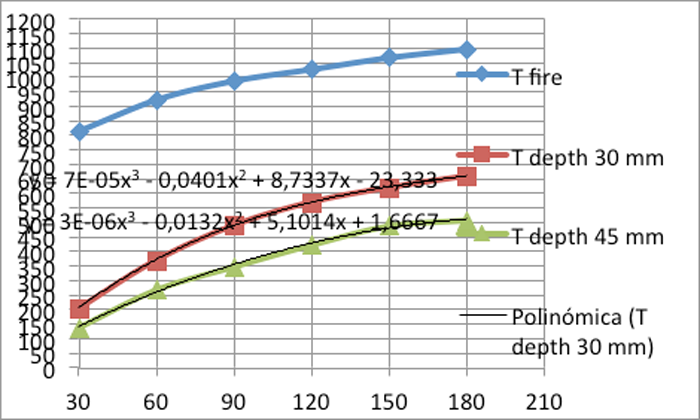 The following table is taken from the document “Méthodede prévisionpar le calculdu comportement au feu des structures en béton (XP P92701 / a1, December 2000) and indicates the temperature reached in a fire, according to the standard fire curve, as a function of time that lasts the same. Table 1. Méthode de prévision par le calcul du comportement au feu. 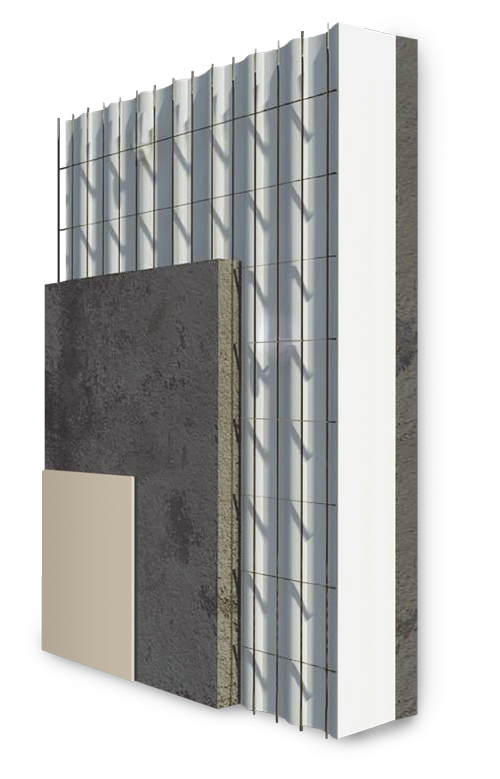 The covering of the reinforcement of the panel is equal to 27.5 mm of concrete + 10 mm of plaster; this equates to a total of 45 mm of concrete. Thus the predictable temperature of the armor on the hot side at 120 minutes after the start of the fire would be 425°C according to Table 2. 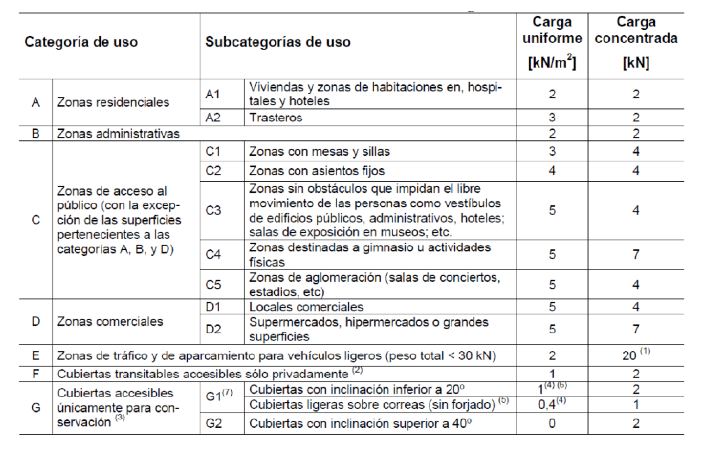 The following tables, obtained from EUROCODIGO 2: Design of concrete structures. Part 1-2: Fire Resistance (ENV 1992-1-2) indicate the loss of tensile strength of the reinforcement steel (fyk) of a reinforced concrete and the compressive strength of the concrete itself with siliceous aggregate (fck), as well as the decrease in the modulus of elasticity, as a function of the temperature reached by the material. 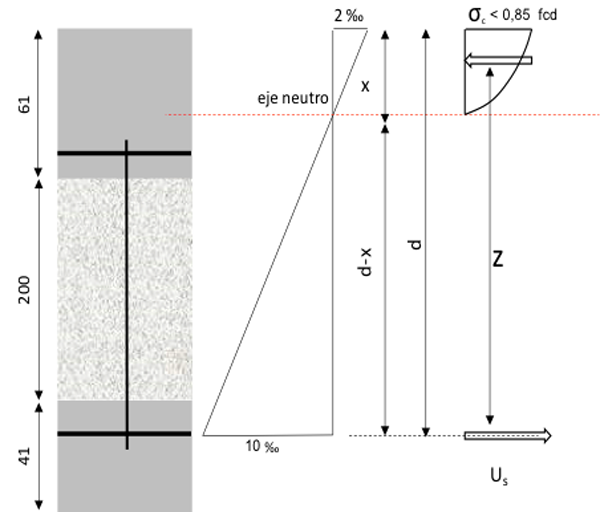 Interpolating in Table 3 at a temperature of 425°C the loss of capacity of the reinforcements of the lower face of the panel slab after 120 minutes would be less than 20%. The value of the Flexor Moment in the ultimate limit state of the Baupanel® BSF 200 panel in the secondary direction is according to its technical data sheet equal to 11.18 kNm / m.
Figure 4. Schematic ELU panel BSF 200. Table 3. Technical Specifications for panels BSF 200. Mu120 = 0.8 x 11.18 kNm / m = 8.94 kNm / m. When this value is greater than the Flexor Moment due to the loads, the forecast is that the slab will mechanically resist the actions for 120 minutes. Mechanical failure would occur when the face-to-fire steel lost more than 50% of its strength and then the Flexor Moment of the actions whose value is: Mmax = 0.001 x 0.841 x 4.002 x 42 = 565 Kgm / m = 5.65 kNm / m That could happen as observed in the tables at a temperature of 550ºC that corresponds to a fire exposure greater than 180 minutes. Up to here the behavior forecast. Table 2. Design of concrete structures. Part 1-2: Fire Resistance (ENV 1992-1-2). Reached the time of 2 hours it could be observed that the average temperature of the oven was 1038.2°C and the average temperature of the upper face was 56.88°C. Taking into account that the ambient temperature was 28.4°C, the heating of the unexposed face had been only 28.5°C. The test starts at 13:16. Figure 5. Horizontal oven view at the beginning of the test. Figure 6. Bottom side of the Baupanel slab inside the oven. Figure 7. 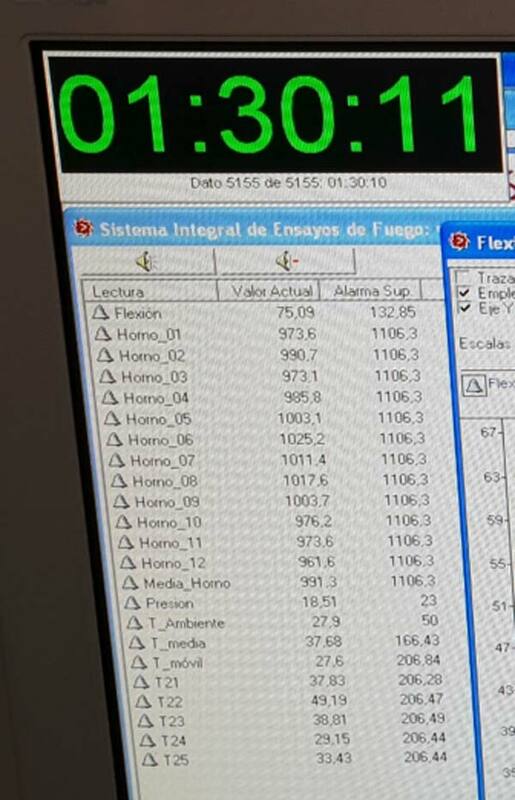 Computer screen with indoor temperature data. Figure 8. Variation of deformation over the duration of the test. After 1 hour 13 minutes, the average temperature of the upper face was only 31.16°C while the inside temperature of the hour was 977.7°C. As seen in Figure 6, the evolution of the deformation remained linear. The deformation continued to vary linearly, reaching 92.7 mm. Checked so that there was no reason to interrupt the test, since both the temperature of the face not exposed and the deformation had not reached the pre-set limits, it was decided to continue the test trying to reach 2 and a half hours. Figure 10. Computer screen after 2 and a half hours. Average temperature of the oven: 1055.3ºC Average temperature of the face not exposed: 76.41ºC Flexion: 124.84 mm. Figure 11. View of the upper face at the end of the test. Although the temperature of the unexposed face was low enough to continue, the finalization of the test was decided since the rotation of the section had tilted the loads located near the support and there was a risk that they would be they will displace by fall on the slab. The heating above the ambient temperature was only 48°C. The ΔT was almost 979ºC When the side hatch of the furnace was opened, once the test was completed, the state of the lower face of the floor could be seen. Figure 12. View of the underside of the floor in incandescent state. Figure 13. View of the slab during its lifting to remove it from the oven. Figure 14. View of the lower face to remove the slab from the oven. Some detachment of the concrete from the lower layer could be observed in some areas, but the slab has maintained integrity when removed from the furnace. The loads applied (841 Kg / m2) have been supported by the floor during the entire test for 150 minutes. Figure 15. Deformation and deformation speed of the slab. The result has also been extraordinary in terms of the good correlation between predictable and actual behavior. 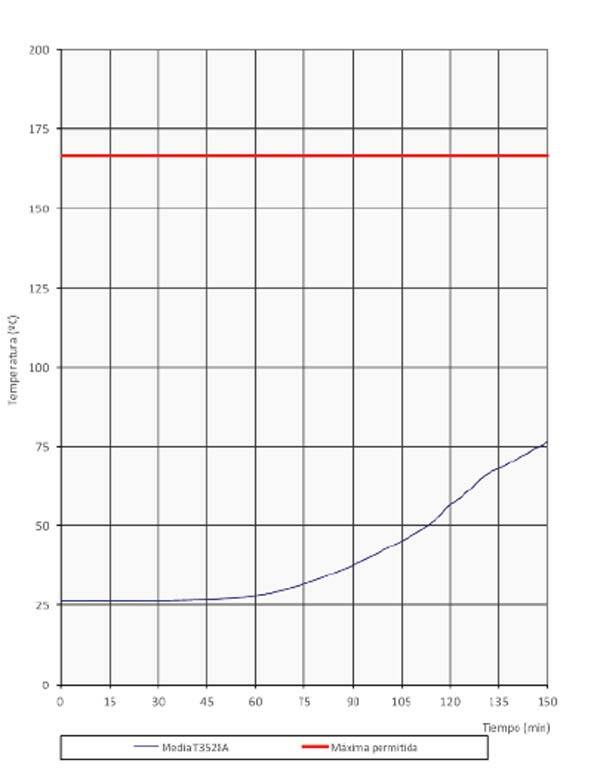 The graph has shown that the increase in deformation has been proportional to the loss of capacity of the reinforcements due to exposure to the high temperatures of the furnace. The coating of the most exposed bars (secondary reinforcement) was only 22.5 mm of concrete plus 10 mm of gypsum. Figure 16. Thermographic images captured during the test. When the EPS is heated, it softens and shrinks progressively from 110 to 120°C for the type “F” that is used in the panel and finally melts. At higher temperatures, 260°C, combustible gases are released by decomposition of the melt. This would happen after 40 minutes, according to the polynomial indicated in the red curve. Figure 17. Graphical representation of the values in Table 2. These gases do not ignite until reaching, always with the contribution of external heat, the 500 ° C (auto ignition temperatures of the EPS type “F”). 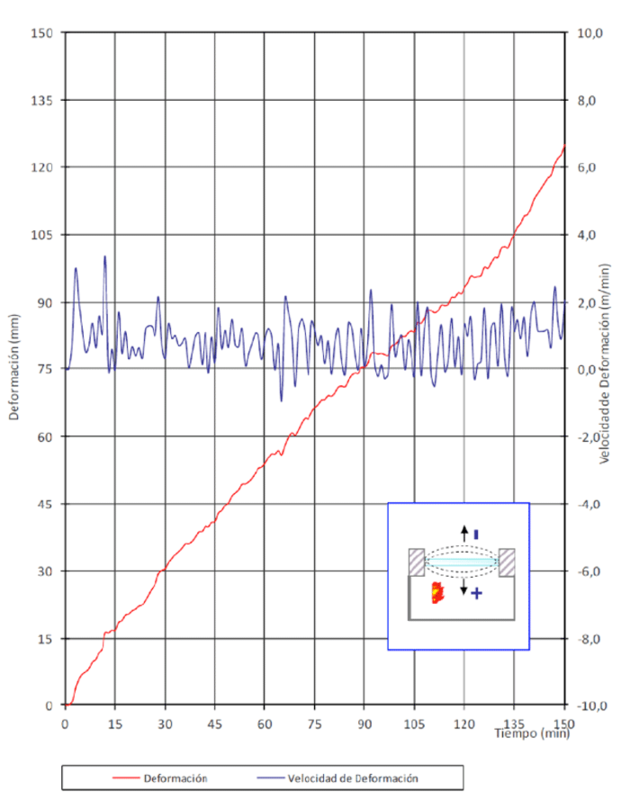 This would occur after 100 minutes, using the polynomial indicated in the red curve for the calculation. The possibility of these gases being burned by a flame or spark greatly depends on the temperature, the duration of their exposure to heat and the amount of air that flows around the material (the availability of oxygen). It is important to note that the air contained in the cellular structure of expanded polystyrene does not have enough oxygen for the combustion, even incomplete of the material, since for it, with density 15 kg / m3, the need for air is 150 times greater, in volume , that the one that occupies the material. This means that there can be no combustion of the material, when it is protected by the layer of micro concrete, which prevents the arrival of oxygen, even when an external flame (for example a short circuit) is applied to it. While the concrete remains intact, the speed at which the change in temperature occurs will depend solely on the value of its thermal diffusivity, which generally decreases with the increase in temperature. The EPS to retract first and then melt will result in the appearance of an air chamber whose thickness will increase, to the detriment of the thickness of the insulating material. Air, unlike solids, has no capacity to store heat inside but is a means to transport it to the softened EPS area. The air increases its conductivity and its thermal diffusivity as the temperature increases. The greater the thickness of the EPS, the more time will be required for the temperature increase of the face not exposed to fire. Throughout the course of the test a very large thermal load sustained through the power of 500 kW of the LICOF laboratory furnace is applied. In the case of a real fire, the fire load is much lower and extinguishes quickly once the fuel consisting of furniture, curtains and other household items is consumed. Given that the EPS of the panel is confined by the concrete layers, there would be no possibility of adding fumes released even in a hypothetical but improbable EPS combustion. Even so, in the combustion of the EPS, fumes with very low toxicity are released, which are considerably lower than those released by other materials commonly used in a home such as wood, cotton, wool, silk, etc. The performance of the Baupanel® BSF 200 slab has been highly satisfactory. It has maintained all the required conditions of integrity, strength and insulation to pass the fire resistance test for 2 hours and 30 minutes, becoming the lightest floor slab available for use with 5 kN / m2 overloads. Table 4. Characteristic values of the overloads of use according to DB SE-AE. According to the table, it can be seen that the panel tested covers all the categories of use established in the CTE, ranging from all residential areas to those destined for supermarkets, public buildings, garages, etc. 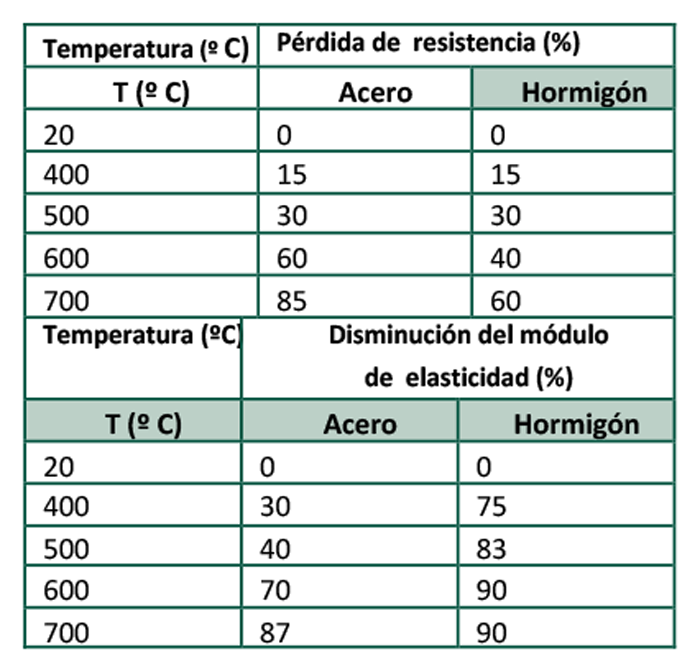 Figure 17 shows how far the average temperature of the unexposed face has been from the maximum acceptable temperature for compliance with the thermal insulation requirement of the slab. Figure 18. Computer screen detail at 1 hour and 30 minutes. Figure 19. Evolution half face temperature not exposed. The thermal insulation capacity of the facades and roofs of buildings are fundamental to define their conditions of habitability and comfort; but in case of fire, that part of our system that is the EPS core, will also be a very important collaborator for the protection of people. This would be a relevant case of extreme use of thermal insulation in our construction system and constitutes a new proof of the incredible thermo-mechanical performance of the Baupanel® System structural elements, even in emergency situations to the limit of what is possible.